Hypothesis The presence of nonsentinel lymph node (NSLN) metastasis after having a positive sentinel lymph node dissection finding is associated with tumor size and stage, the presence of lymphovascular invasion, micrometastasis, and extranodal extension. Patients Four hundred seven consecutive patients at a single institution who underwent sentinel lymph node dissection as part of breast conservation or mastectomy with biopsy-proved cancer. Intervention Completion axillary lymph node dissection and definitive therapy. Main Outcome Measures Sentinel node metastasis, NSLN metastasis, tumor size and stage, lymphovacular invasion, micrometastasis, extronodal extension, histological tumor characteristics, and number of sentinel nodes removed. Results In a univariate analysis, size of the primary tumor and extranodal extension were associated with having positive NSLN findings. The presence of micrometastasis was associated with negative NSLN findings. When all factors were included in a logistic regression analysis, the significant predictor of NSLN metastasis was extranodal extension (P = .002). Lymphovascular invasion was not associated with positive NSLN findings (P = .11). The number of sentinel nodes removed also had no bearing on the status of the NSLNs (P = .37). Conclusions Although primary tumor size and micrometastases correlate with the status of the NSLNs, extranodal extension is the most important independent predictor of NSLN metastasis. These findings may ultimately spare patients a full axillary lymph node dissection. However, pending results of larger clinical trials, full axillary lymph node dissection is still recommended for patients with sentinel lymph node metastases. During the past 3 decades, the surgical management of breast cancer has changed significantly. 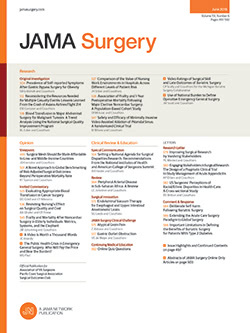 Several large multicenter trials have established that lumpectomy followed by radiation therapy, or breast conservation, is no different in terms of overall survival than mastectomy.1-5 With the advent of sentinel node biopsy, a similar shift in the paradigm to minimal axillary surgery is also evolving in the management of axillary disease in breast cancer. Because axillary lymph node involvement is the most important prognostic factor in patients with breast cancer, the status of the axilla is an essential component of staging in patients with breast cancer.6-10 However, axillary dissection is not without morbidity. Arm lymphedema is one of the major complications of axillary dissection, particularly when patients also undergo radiation therapy.11-14 Other complications such as neuropathies, seromas, and wound infections also affect a significant number of patients. Most patients with stages I and II breast cancer do not have axillary lymph node metastasis. Sentinel node biopsy has proved to be an important tool in sparing a large population of women with breast cancer from a full axillary lymph node dissection (ALND). Women who have negative sentinel node findings do not have to undergo a full ALND. However, the current accepted practice is to perform a full ALND when the sentinel node finding is positive. Attempts have been made to help identify the subset of patients with positive sentinel node findings who could be spared a full ALND because of the low likelihood of nonsentinel lymph node (NSLN) metastasis. Previous studies have shown that as many as 50% to 65% of patients with sentinel node metastasis have no other axillary metastasis.15,16 The benefit of performing a complete ALND on these patients is being called into question. We aim in this study to identify those factors most likely to be associated with NSLN metastasis. An analysis of our prospective database was performed of all sentinel lymph node dissections (SLNDs) performed at Columbia Presbyterian Center, New York, NY, from January 1, 1998, to September 30, 2001. The SLND was performed as part of breast conservation surgery or mastectomy in all patients with biopsy-proved breast cancer. The sentinel node was identified using a combination of 1% isosulfan blue dye as described by Giuliano et al17 and technetium Tc 99m sulfur colloid as a radioactive tracer. The isosulfan blue dye was administered in a peritumoral fashion at the time of surgery, and the radioactive tracer was injected the day before or in some cases the morning of the surgery. All sentinel nodes were submitted to pathology for analysis using hematoxylin-eosin and immunohistochemical staining for cytokeratin. For all patients, age, tumor size, histological tumor characteristics, and the numbers of sentinel nodes removed, positive sentinel node findings, NSLN removed, and positive NSLN findings (NSLN+) were recorded. We performed statistical analysis using the χ2 test for categorical variables; an unpaired, 2-tailed t test for continuous variables; and multivariate analysis to determine if any of these markers alone or in combination would predict the status of the NSLN. We calculated and present odds ratios (ORs) and P values. Statistical significance was evaluated at the .05 α level. A total of 407 patients were included in this study. Of these, 70 (17%) had positive SLND findings. The mean age of this group was 54.9 years (range, 32-77 years). Fifty-three patients (76%) had negative ALND findings, and 17 (24%) had positive ALND findings. The mean number of sentinel nodes removed was 2.35. Table 1 gives tumor size and stage, status of lymphovascular invasion (LVI), extranodal extension, and histological tumor characteristics. The mean tumor size of these 70 patients with positive SLND findings was 1.8 cm (range, 0.1-7.2 cm; SD, 1.17 cm). More than half of the patients (n = 36) had T1c lesions. The most common histological finding was invasive ductal carcinoma (57%). Thirty-five patients (50%) had lymphatic invasion in their sentinel nodes, but 19 (27%) had extranodal extension. When comparing those patients with NSLN+ with patients who had negative nonsentinel node findings (NSLN−), we find that although 70% of those patients with NSLN+ presented with LVI, only 43% of patients with NSLN− had LVI (Table 2). This difference, however, did not reach statistical significance (P = .11). Extranodal extension was found in 59% of patients with NSLN+ vs only 13% of patients with NSLN− (Table 2). This association was statistically significant (OR, 9.01; 95% confidence interval [CI], 0.03-0.39; P = .002). Only 5 patients with NSLN+ had micrometastases in their SLND vs 29 patients in the NSLN− group (Table 2). This association was also statistically significant on results of univariate analysis (OR, 3.16; 95% CI, 0.10-1.03; P = .06). Mean tumor size was another factor found to be statistically significant between the NSLN− and NSLN+ groups (OR, 1.69; 95% CI, 1.04-2.75; P = .04). Estrogen receptor status and progesterone receptor status of the primary tumor were not statistically significant on univariate analysis (P = .11 and P = .33, respectively; results not shown). These results are summarized in Table 3. The number of sentinel nodes removed was also examined to see whether the number of NSLN+ was related to the initial number of sentinel nodes removed. This association did not approach statistical significance (P = .37). When these data variables were subject to multivariate logistic regression, extranodal extension was the statistically significant factor (OR, 9.0; 95% CI, 2.6-31.3; P = .002) (Table 3). Several efforts have been made to identify those patients in whom the status of the sentinel lymph node would accurately predict which ones would need a full ALND and those patients in whom a negative SLND finding would reliably imply that no further surgery would be necessary.20-24 We found on univariate analysis that tumor size and extranodal extension were significantly associated with presence of NSLN involvement of metastasis. In addition, the presence of micrometastasis is predictive of negative NSLN involvement. In their review of 157 patients who underwent SLND during a 6-year period, Chu et al21 found that 33.5% had positive sentinel lymph node findings. The most important predictors of NSLN metastases in their study were size of sentinel node metastasis and tumor size. In a series by Weiser et al20 of 1000 patients who underwent successful SLND, 231 patients (23%) had positive sentinel lymph node findings.20 The critical factors in their study that contributed to NSLN metastasis were tumor size, LVI, and sentinel lymph node micrometastasis. Other attempts to identify predictors of NSLN metastases, such as the study by Abdessalam et al,23 also found LVI along with extranodal extension and micrometastasis of the sentinel lymph node to correlate with NSLN metastasis. These studies are consistent with our series in determining that primary tumor size, micrometastasis, and extranodal extension correlate with NSLN metastasis. Another study published by Sachdev et al24 also found LVI along with macroinvasion and tumor size as predictors of NSLN metastasis. In their study, the sample size was 190 patients, of whom 29% had sentinel lymph node metastasis. Although these studies found a significant association between LVI and NSLN metastasis, we did not find the same association in our review. This could be in part due to our small sample size of 70 cases vs the larger series published previously. Although our own study did not find a significant correlation, perhaps because of small sample size (type II error), the larger studies suggest that the presence of LVI in the sentinel node is a significant predictor of NSLN metastasis. Micrometastasis was a significant negative predictor of NSLN metastasis on results of univariate analysis. In our series, 70% of the NSLN+ group did not have micrometastasis. However, almost half of the NSLN− group also did not have micrometastasis. It could be that micrometastasis in association with tumor size is a better predictor of NSLN metastasis. In their series, Turner et al25 also speculated that micrometastasis along with unfavorable tumor characteristics would most likely better predict those patients who could benefit from a complete ALND. The introduction of SLND into the armamentarium of breast surgical management has revolutionized the management of the axilla in breast cancer patients. However, like all innovative techniques, it raises more issues than it answers. Given the morbidity of full ALND and the low proportion of patients who present now with NSLN metastasis, a method to identify patients who could be spared full ALND would be beneficial. In our study, we found that tumor size and extranodal extension are significant predictors of NSLN metastasis, and that micrometastasis is a significant predictor of negative NSLN metastasis. However, none of these factors alone is sufficient to be applied clinically. Several other groups have also attempted to answer this question and have come to different conclusions. Until the results of ongoing large randomized trials26-28 such as the ACOSOG-Z0011 and the NSABP-B32 provide more substantive data, completion ALND should remain the appropriate management for patients with sentinel lymph node metastases. Accepted for publication November 18, 2003. This study was presented at the Society of Surgical Oncology Cancer Symposium; March 7, 2003; Los Angeles, Calif. Corresponding author and reprints: Kathie-Ann Joseph, MD, MPH, 161 Fort Washington Ave, Suite 1025, New York, NY 10032, (e-mail: kpr2@columbia.edu).